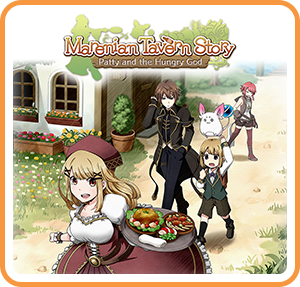 Marenian Tavern Story: Patty and the Hungry God (henceforth known as MTS) is a newly released Switch RPG developed by Rideon and published by KEMCO that teaches us that more than just obesity can come out of consuming an excessive amount food. From the same team that brought Adventure Bar Story to the 3DS a few years back, MTS is a goulash of systems that consist of turn-based combat with some life simulation/management thrown in to serve as its herbs and spices. There is a level of freedom that is suggested through the game’s marketing with its “what will your tavern be like” tagline that is quite refreshing, but does it actually live up to those words in practice? Easygoing siblings Patty and Gino are fortunate enough to live somewhat in the upper crust of society in Marenia, much in thanks to their father’s successful five-star tavern in town. That is until one day, Gino does what kids do best – he breaks something. Falling into an obelisk on the side of the road awakens Pikach-uh, I mean Coco, the God of Poverty. Coco uses the opportunity to possess the young child, which in turn instantly wreaks havoc on the family’s financial status. In what feels like a matter of minutes, the bank seizes all of their assets and kicks Patty, Gino, and their butler Romano, out into the streets. At the moment, your father is nowhere to be found, so the three seek shelter at a nearby village. With the help of the local townsfolk, they are able to establish a new tavern that not only puts a roof under their head, but serves as a means to appease the God of Poverty (thus eliminate his possession of Gino) and ultimately bring their books back into the green. The premise of MTS is not something that will necessarily hook you from the very beginning, nor does the overall story merit any sort of award recognition, but it is entertaining enough to see it to completion. There are a handful of people that will join Patty’s team as you progress, and improving your tavern gives opportunities to experience brief cutscenes that dig further into each of their lives. An occasionally spotty translation does mar the overall presentation a bit, however. The ultimate objective in MTS is to build up your tavern in order to sate the God of Poverty, which in turn will allow for you to get the family’s life back on track. This is done by a three step process: gathering ingredients, cooking, and running the tavern. The gathering portion has your team going to various locations and collecting materials, and that is accomplished by a combination of buying sundries from local shops, harvesting nodes out in the field, and killing enemies in turn-based battles. All gathering avenues are fairly simple and straightforward (including the combat), which is a bit unfortunate. The turn-based battles are actually a nice touch to this type of game, but they are not near difficult enough to be consistently engaging in the long-run. Thankfully, systems exist to help make combat more tolerable during long sessions by way of auto-battle options and encounter-reducing items. Search Skip Tickets are a premium item that allow you to automatically collect materials from a single field/dungeon once per game day, eliminating the battle portion of gathering altogether. These require an in-game currency that is an unfortunate byproduct of their mobile roots, which will be discussed in detail later. Once you have materials in-hand, you can head back to the tavern and start preparing some food. There are about 600 recipes in MTS, which sounds more exciting than it actually is because you’ll just end up cooking the dishes that you have ingredients for, ones that are most profitable, and ones that give the most EXP. Yes, eating in MTS is how you level up your characters as killing monsters only grants combat skill-specific EXP and gathering materials. Regardless, the plethora of recipes available to you are unlocked by progressing the story, talking with townsfolk, searching through bookshelves, and through your own experimentation. One positive to having so many recipes is that you will likely always have something to cook with whatever ingredients you might have on hand, but they really could have went with less overall choices as to make things feel a bit more concise. After you’ve prepared a stockpile of dishes, it is time to open your tavern for business. Each game day, you will have the opportunity to prepare the tavern’s menu by selecting a handful of your dishes to feature on it. Each dish has their own associated price, ease of sale, and popularity. In MTS, the seasons change with time, so some dishes may be more popular in the colder seasons than they are in the midst of summer. And even the easiest salable dishes will have to be changed out from time to time, as your customers will eventually grow tired of seeing them on the menu. In addition, your tavern’s menu inventory is not infinite, and is completely based on how many of each dish you keep in stock. Therefore, it always pays to check the stock levels and popularity of each item in order to keep things running smoothly at the tavern. When the tavern closes for the day, you get a summary of your current inventory and the total sales made before the entire process begins anew on the next day. But What About That Rat God? Ah yes, we cannot forget about the God of Poverty. Coco’s debt-inducing powers are directly tied to his hunger level, and he/she/it is starving after being holed up in that obelisk for God knows how long. Essentially, you will be in a never-ending cycle of debt unless Coco’s appetite is suppressed. Luckily, you will already be cooking up a bunch of stuff to keep the tavern going so, eventually, you might be able to satisfy their hunger as well. Don’t let the size fool you – Coco has the appetite of a whale, so the process will be a journey in itself. As far as gameplay goes, there are a lot of moving parts in MTS, and they all work well enough. While many of the systems lack a meaningful amount of depth (combat being too easy, farming, fishing, and the actual cooking process not actually being fully-fledged systems in themselves, etc), I still found myself enjoying the game. It is very repetitive in nature, however, and the requirements to rank up your tavern to the next level climb drastically with each rank you attain. Regardless, only by progressing the story, feeding Coco, and making mad profit will you rank up your tavern from paltry status to a five-star service. MTS uses a blend of pixel art and basic polygonal-based assets to build its world, and I am a big fan of it. Although the maps themselves aren’t incredible works of art, they compliment the pixel-based sprites quite well. In some ways the overall aesthetic reminds me of Breath of Fire III, one of my favorite RPGs of all time. The soundtrack in MTS also features some catchy tracks, though that sentiment doesn’t apply to the entire album. Jewels are the premium in-game currency mentioned earlier, and it should come as a relief that there does not seem to be a way to buy them with real money in the Switch version. I would highly advise against using them at all unless you want to make the game even easier than it already is, but definitely consider using them on the aforementioned Search Skip Tickets to ease the material gathering process. MTS has been one of the more difficult games for me to rate. On one hand, I found myself enjoying its many gameplay features despite most of them being a little shallow in execution, thus leading to potential burnout from their repetitiveness. However, we also have to weigh the game’s price, and MTS sits at $19.99USD while its mobile counterpart is $7.99USD. I’m not entirely certain that everyone will feel that MTS is worth $20, even though players that enjoy a more casual oriented game might have no problem throwing the proper funds at it. If you can come to terms with the full retail price being a little unreasonable, running a tavern in Marenia can be pretty fun. Did you play the mobile version as much as Switch? At $8, I could see getting it on mobile as it looks like my kind of game. I did not play the mobile version, but it might be the way to go due to the price and if it is structured the same way as the Switch version, of course.